The CipherTV system has built a complete head-to-tail IPTV broadcasting technology with all the components to make a reliable and modern system. Our technology offers solutions for commercial partners to expand their new media broadcasting initiatives outside the typical, regulated broadcasting environment. CipherTV comes in a colorful box packaged with everything the subscriber needs to setup instantly in their home. Our partners are able to enable or disable channel packages at the click-of-the-button in their ISP Manager system. CipherTV has a paid option to replace our existing Android home screen launcher / apps with a controllable, digital signage launcher. This option an ISP, hotel or community group to manage their own branded messages from an online dashboard, while still opening into the full CipherTV service. Monetize your content through over-the-top licensed distribution on the CipherTV platform. Your content becomes available for end-users to order through one of CipherTV’s many ISP Partners. 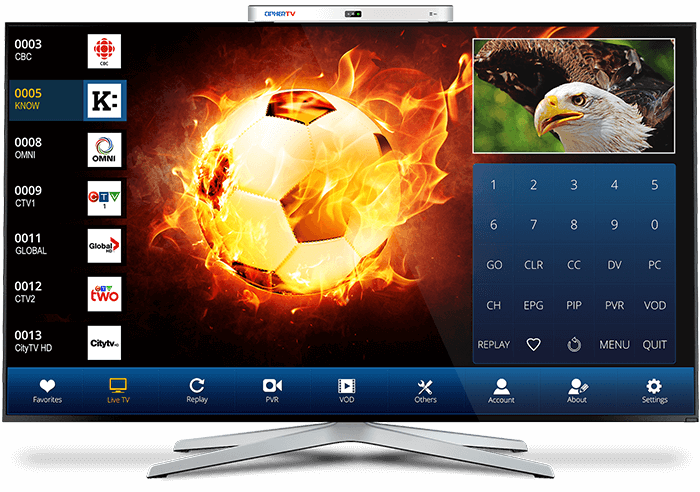 CipherTV has both strong network capability and IPTV broadcasting technology, enabling recorded or live sports, events, classrooms or seminars to be broadcast over the internet to the convenience of a downloadable Android, iOS and Windows App. We offer innovative ways for international ISP’s to broadcast their licensed content at a fraction to cost of alternatives. Interested in getting started with CipherKey? We’d love to hear from you. Send us your information and we will contact you back. The BC Broadband Conference brings together Internet Providers, Equipment Vendors, and Industry Stakeholders annually to discuss new technology and trends within the industry. Copyright 2019 CipherKey Exchange Corp. All rights reserved.